Artist impression of the 480 Hay Street development Perth CBD. 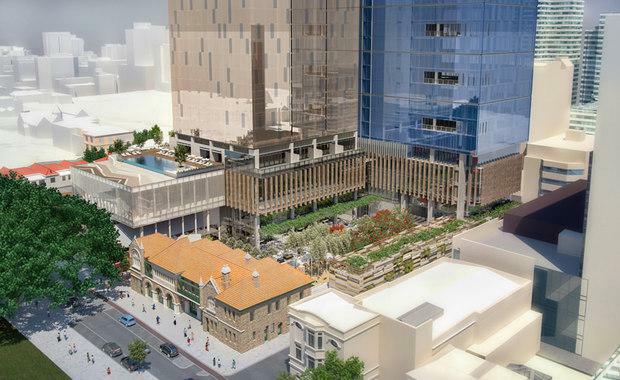 The $500 million Perth CBD development at 480 Hay Street is one step closer to beginning construction since receiving development approval from the City of Perth. BGC Development Director Julian Ambrose welcomed the approval as the BGC and Starwood Hotels and Resorts venture was originally rejected by committee members during the first submission. Bounded by Murray Street, Hay Street and Irwin Street, the development is to be anchored by the five-star hotel The Westin Perth and a 22-story A+ grade office tower. The project will involve significant heritage refurbishment work, as well as delivering a range of creative and unique public spaces housing food, beverage and retail offerings. BGC and Starwood Hotels and Resorts have a history of successful partnerships, delivering the Aloft Perth Rivervale at The Springs and now The Westin hotel brand to Perth scheduled to open in 2017. "BGC Development, Starwood Hotels & Resorts and our design teams have worked to create a precinct that will deliver a further boost to Perth's growth and evolution as a capital city - and a new level of sophistication through The Westin Perth," Mr Ambrose said. "Perth's hotel accommodation shortage is well documented, so realising the vision to bring The Westin Perth to 480 Hay Street will go a long way towards resolving the issue in the immediate term," he said. "BGC Development is now looking towards finalising the precinct design and moving into construction to deliver an outstanding outcome that, like other BGC projects, will leave a strong and lasting legacy for Perth."